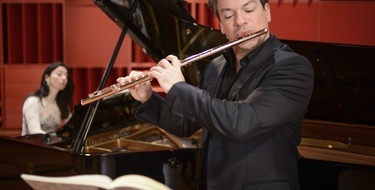 Play Mozart flute duets together with Emmanuel Pahud. First listen to Pahud and Ulla Miilman play the piece through. Then print out the music. Finally play the piece together only you and Emmanuel Pahud- face to face- best possible sound. This has not been possible before - but now you can sit in your living room and play together with one of the world's greatest musicians. Wow! What a fantastic use of technology to bring a great flutist into your own home! The fact that you can play with Pahud is amazing. This is a great practice tool, especially since duets are a very important part of a flutists' repertoire. I really enjoyed these Mozart Duets. They are challenging and the way they are filmed allows you to look directly at Emmanuel Pahud, an important part of duet playing. The Adagio is beautiful and the Allegro is challenging. A nice mix!